Last Wednesday, I joined Joe Zietsman (Texas A&M), Damon Fordham (Cadmus), and Ann Xu (Georgia Tech) in New York for a discussion of Education and Practitioner Training to Promote Sustainability. We were invited to speak at the TRB ADC60 summer conference on Sustainable and Resilient Infrastructure. Wiek et al. (2011) Key Competencies in Sustainability: A reference framework for academic program development. Sustainability Science, 13, pp. 203-218. Rusinko (2009) Integrating Sustainability in Higher Education: A Generic Matrix. International Journal of Sustainability in Higher Education, 11(3), pp. 250-259. Lidgren et al. (2006) A Systemic Approach to Incorporate Sustainability into University Courses and Curricula. Journal of Cleaner Production, 14, pp. 797-809. Mulder et al. (2012) How to Educate Engineers for/in Sustainable Development. International Journal of Sustainability in Higher Education, 13(3), pp. 211-218. Fortuin and Bush (2010) Educating Students to Cross Boundaries between Disciplines and between Theory and Practice. International Journal of Sustainability in Higher Education, 11(1), pp. 19-35. Warburton (2003) Deep Learning and Education for Sustainability. International Journal of Sustainability in Higher Education, 4(1), pp. 44-56. What knowledge and skills do students need to learn? 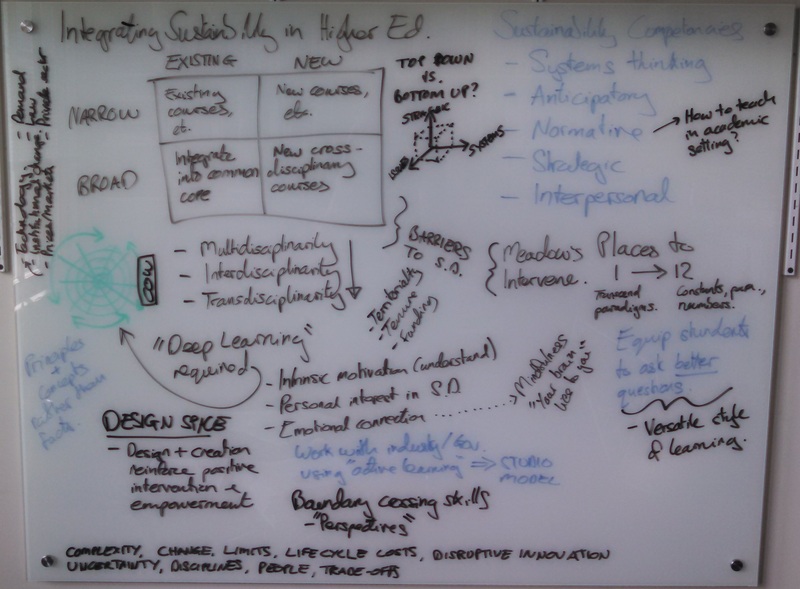 How should we promote ‘Sustainability in Higher Education’ (SHE) – e.g., top down vs. bottom up? How do we change the hearts and minds of faculty? What should be the role of non-academic entities – e.g., government agencies, private businesses, and NGOs? While I was only able to briefly respond to these questions in my presentation (below), the literature I cite on my slides (and listed above) should provide a useful starting point for anyone interested in learning more about theories on how to teach sustainability.